Even though I was an avid soccer mom for many years, my family enjoys watching football, and I prepare lots of tasty snacks during football season. Pizza and chicken wings are always on the menu, but Buffalo Chicken Wing Dip is a must. It is a delicious, quick, and very easy to make dish, and you never have to worry about storing leftovers, since there won’t be any. For ladies night out, I use Light Ranch Dressing, Fat Free Cream Cheese, and Low Fat Cheddar Cheese. Preheat over to 350? F.
Combine the shredded chicken breast and hot sauce. Add the softened cream cheese, Ranch Dressing, and Cheddar Cheese. Bake uncovered for 30 minutes, or until boiling. Serve warm with carrots, celery, pretzels or crackers. This is also a great dish for office parties. My favorite hot sauce for this recipe, is Frank’s RedHot Original Cayenne Pepper Sauce, and my chosen cracker to use, is Nabisco’s Triscuit Whole Wheat Original Cracker. This dip freezes well! I make a double batch, and freeze half of it for a rainy day, or unexpected company. Just reheat it in a microwave, and serve. Hey! I make this similar recipe for every big game, my friends insist on it. Unfortunately, the Eagles are not going to the superbowl so I will most likely not be watching…. so sad, but at least the dip is good! I guess I know where I’ll be watching the big game!! I also have yet to see any leftovers of this great snack. We need someone to bring a Nirchi’s pizza down. …..there is always a next time…..I am sure the Eagles will make it then….and you’ll have a chance to sport your dip again, or find some more interesting recipes on my website, to impress your guests with. That’s very true! There is hardly ever any dip left by the end of a game night. Best Nirchi’s pizza is on 434 in Vestal, NY……all the New York Giants fans will clean them out, for sure, on Super Bowl Sunday! 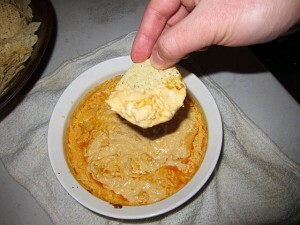 Buffalo Chicken Dip is so popular lately! It even has it’s own website: http://www.BuffaloChickenDip.com. I make it using Swanson Chicken because it is so easy to use canned chicken and Swanson’s is made with only white meat (I work for them so I know). Also, you can substitute blue cheese dressing for the ranch dressing and blue cheese crumbles for the cheddar if you want a little more bit. Yum! Kait, thank you for your wonderful suggestions to give this dip a new twist. I am sure the blue cheese lovers will appreciate it. This is some great dip. Easy to make and you’re even able to easily modify the recipe to spice it up to your own personal preference. That is the fun part about this dip…you can personalize it to your own taste, without worrying about messing it up. Keep in mind that some people allergic to penicillin may also be allergic to blue cheese. Be careful when serving to guests who may have this allergy. Thank you very much for your very valuable input about allergies, that someone allergic to penicillin might also have allergies to blue cheese. I am sure not too many people are aware of this. On another note….I also have been told that some people having allergic reaction to peanuts will also have allergies to peas. I prefer the blue cheese version of this dip, as that is how all of the Buffalo wings here in Western new York are served. Also, must have Franks for this dip, great hot sauce, not too spicy, just the right amount of kick to not overpower the people who do not like ‘hot” wings. Since I lived in New York State during most of my adult life, and enjoyed the BEST WINGS in the US, I do agree about the Blue Cheese perfect pairing with wings, but I am not a big fan of blue cheese myself. Sound great though….and yes, Frank’s hot sauce is THE BEST!